C'mon, Eipix, couldn't you come up with a better story? It is the season for family reunions, and they don't always go as we'd like to. We don't need another awkward family gethering in our games. Or do we? To be honest you will probably enjoy this spooky family-themed story no matter what family situation you deal with in real life. This reunion has been put together by cousin Patrick. You were invited along with some other relatives you've never met or even heard of. Phantasmat: Behind the Mask Collector's Edition is a great release to the series that began with Phantasmat Collector's Edition, that is still favorite for many fans of the genre. All the following releases were not a disappointment at all. In this release, you are going to a family reunion at Ward Estate. The estate is no good shape and requires a lot of fixing and renovation. So does your family as you learn. The closer it gets to midnight, the more awkward it gets. And not just awkward, but rather dangerous too. This reunion has been put together by cousin Patrick. You were invited along with some other relatives you've never met or even heard of. Most of them are quite eccentric. You soon realize that they are ghosts with some dark past as the living. As I said before, you will enjoy the story and all the character (you even get to learn their biographies). The graphics are great depicting all the creepiness and the decay of the estate and the gloominess of the family members. It is a really great story for the season of family reunions. It is actually quite fitting. The game is just packed with puzzles. 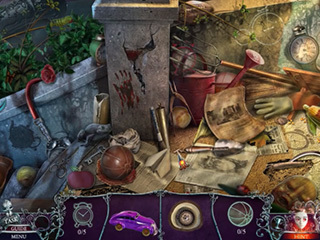 They outnumber the hidden object scenes, but it's more than that. You run into different puzzles - small or big - even in the multi-step HOS or picking up inventory. You can also play a match-three game as an option. You will have to be on the look out for the collectibles and morphing objects - over 60 in total. There are 14 achievements and a souvenir room. 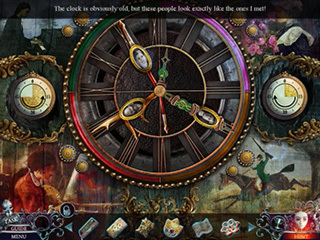 The puzzles and the hidden object scenes are replayable. As usual you get to download music, art, wallpaper. 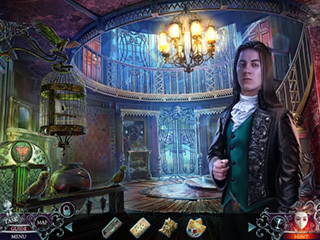 It is a great hiddne object puzzle adventure game with a character. This is Phantasmat: Behind the Mask review. Download this game here.